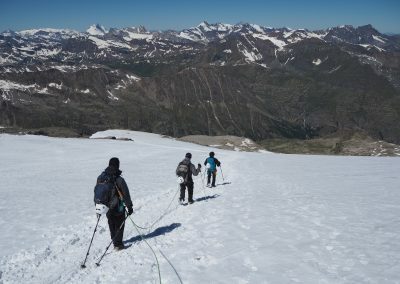 Guided mountaineering trips on some of the famous Alpine Classics with IFMGA certified guides. 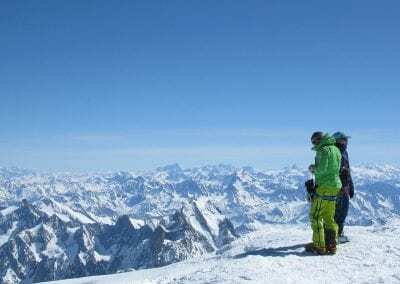 We run guided mountaineering trips in the Alps from spring to Autumn, climbing some of the world famous Alpine Classic climbs such as the Grand Paradiso, Cosmiques Arete and Weissmies. All of our guides are IFMGA certified, and the summer guiding programme is managed by IFMGA British Mountain Guide Ben Bradford. Our summer base is in Chamonix, at the foot of Mont Blanc although we run trips throughout Switzerland and Italy as well. We offer bespoke trips, with individuals and groups. 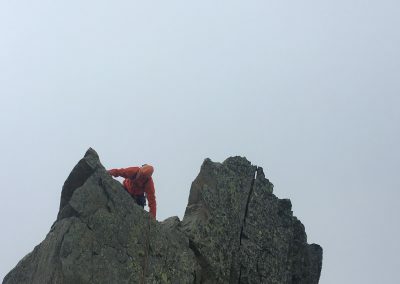 Soaring snow aretes or scrambles are what alpine climbing is all about. 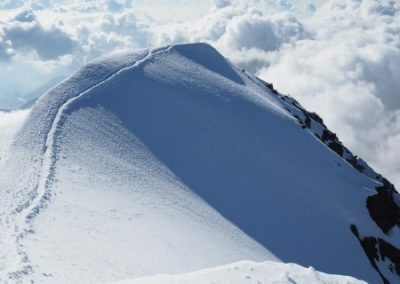 These classic alpine climbs can lead you to lofty 4000m summits or to quieter tops. A lot of our routes in our classic alpinism trips can be climbed on a first visit to the alps, with a couple of days technical training before heading to the objective for the trip. 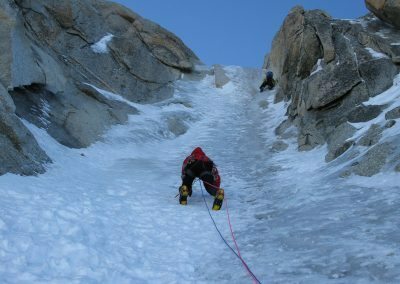 We train and teach you along the way, looking at techniques for glacial travel, crevasse rescue, personal climbing skills as well as the rope work required for your planned ascent. 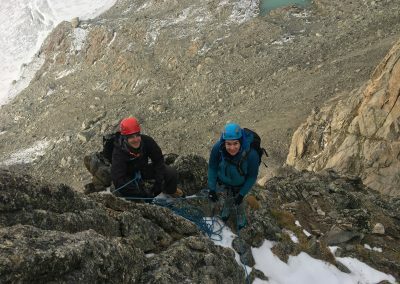 For climbers wanting to learn the techniques to be fully independent, you should attend one of our Alpine Training courses. 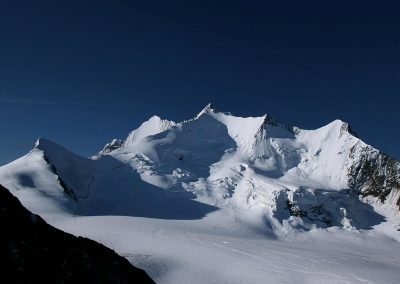 The UIAA lists 82 summits over 4000m in the alps. This is a superb range of peaks from easy snow walks like the Briethorn through to technical and remote summits. Ticking off any 4000m peaks is an adventure, and over the years we have guided many clients to these summits throughout the alps. All of the 4000m peaks demand a good level of fitness, and others a high standard of technical skill. 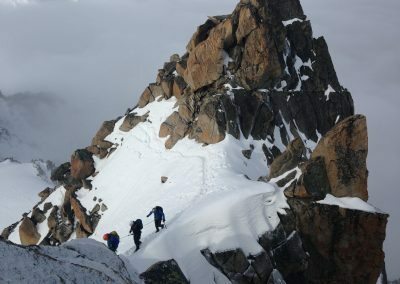 Within our Classic Alpinism trips we climb 4000m peaks like the Grand Paradiso, Weissmies, Mont Blanc and the Bishorn. If you're after a bit more.. have a look at our Big Peaks page. Many of the routes in our Classic Alpinism series don't require pre-alpine experience. 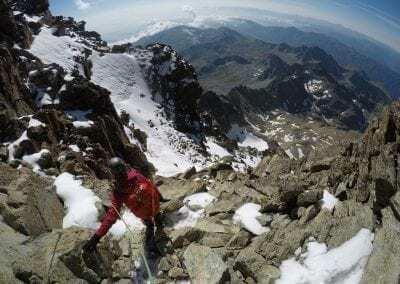 Indeed, climbs such as the Grand Paradiso are ideal introductions to alpine climbing. Having a solid base of hill walking experience will help a lot, and combined with a good level of fitness this will increase your chances of summit success and enjoyment. Every climb is different, and so it will depend on your technical skill, experience and current fitness levels. Each climb in our route index will give you an idea of the experience required, and the technical and physical difficulties of the route. All of our climbs start with an acclimatisation phase where we climb some good routes in preparation for our main objective So we will be able to guide you as to whether you are ready for the mountain. Sometimes objectives will need to be altered to ensure the safety of the whole team (guide included). 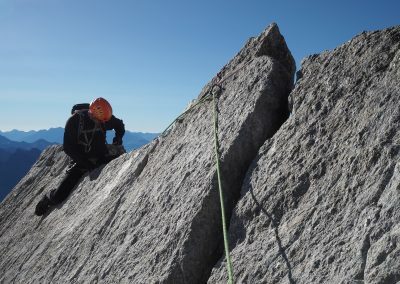 Our classic alpinism trips are run on a private guiding basis as well as open group trips. Sharing the mountain and costs can be great on a group trip, where the shared adventure can be a real motivator. The advantage of a private trip is flexibility, pace and objectives. You can contact us with your goals and preferred dates so that we can put together a programme and quote for you. For our open group trips please check our Scheduled Trips page to see what we've got running. 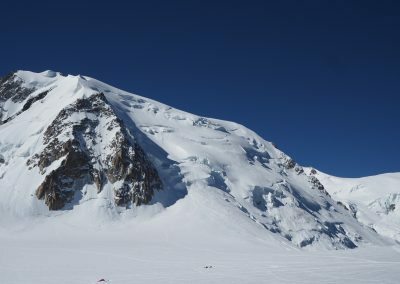 You will find lots of information on our popular Mont Blanc, Grand Paradiso pages. Below is our route index with photos and information on various routes. This is a snap shot of what is possible, so do contact us with your specific ambitions. 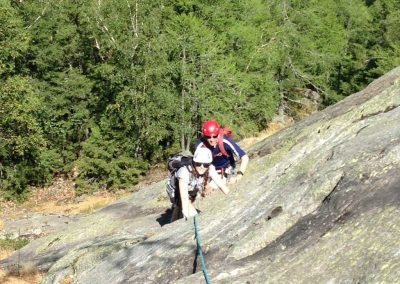 Choosing when to climb your Classic Alpine Climb"
We will guide you as to the best season or time for your trip. 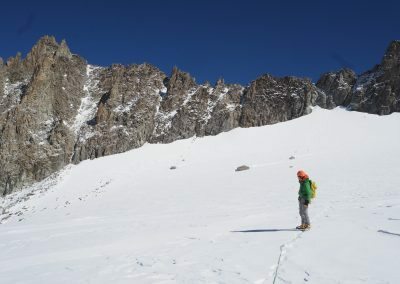 Generally the summer mountaineering season starts in May and can last right through October. The classic season is late June to mid September. For more information on autumn mountaineering have a look here. Within the descriptions on the route index, you will find suggested times for the specific route. Some snow routes are more reliable early season, rocky ones are normally best left until mid season. Contact us with your preferred dates for a private trip and we can then get back to you with a quote and itinerary. We also schedule open trips for mountains run at a 1:2 ratio, or to group like minded climbers together on 1:1 routes. Have a look at our scheduled mountaineering trips. 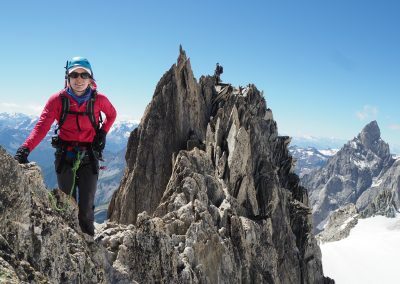 At Vertical Frontiers we also run alpine preparation courses for climbers heading to Europe for some summer mountaineering. These are suitable for a wide range of ambitions, such as Mont Blanc, the Matterhorn etc. Please contact us if you have any questions.